The Boardwalk is situated on the corner of Little Peter Street and Hewitt Street. The property is located in the trendy area of Knott Mill, which is situated at the southern edge of Deansgate. The building benifits from excellent access to both the local and national transport network. Deansgate Station lies within a 2 minute walk which provides direct access to Piccadilly Station and the national railway network. 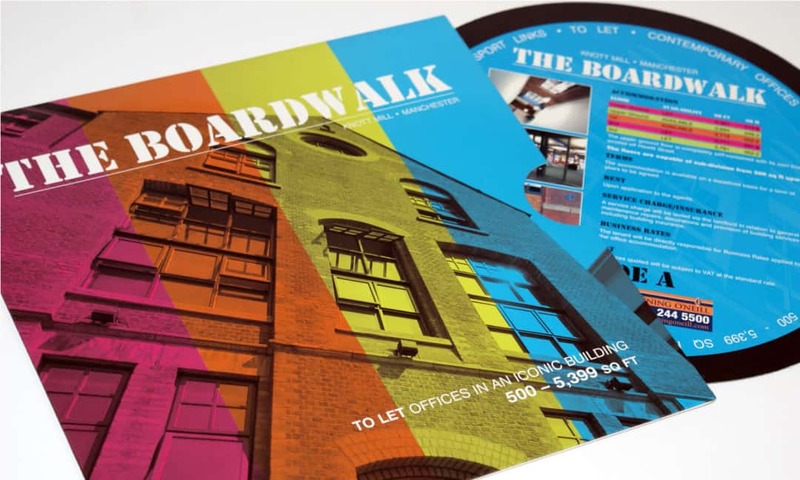 Our design team was appointed by Manchester based commercial property agency Canning O’Neill to create a unique letting brochure for the office scheme as they sought to build a tailor-made strategy ready to launch it to the market. With our reputation in the commercial property market and with our ever growing collection of bespoke brochures, we were perfectly placed to offer all the required skills and guidance needed to create a stunning range of marketing particulars for the scheme reflecting its unique personality. The marketing literature our team produced included a bespoke square folder and a spherical insert taking inspiration from old school vinyl records. The printed material featured a variety of stunning external and internal photography of the building showcasing the schemes full offering.